This chapter begins by distinguishing between the concepts of food security, or access to sufficient food to eat, and food sovereignty, or the right to choose which food to eat. It then distinguishes between the concepts of seed security, or an adequate supply of seed for cultivation, and seed sovereignty, meaning the farmers’ right to choose which seeds to sow, share and save. 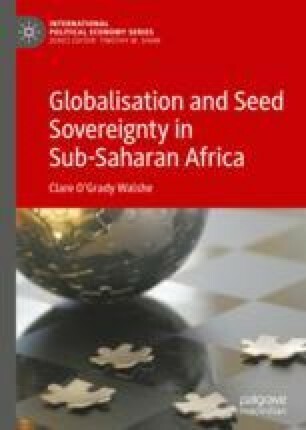 It discusses a number of threats to seed sovereignty from the process of globalisation, including climate change, changes to farming practice, transnational corporations and philanthrocapitalist organisations. It then applies hyperglobalist, sceptical, and transformational approaches to the study of how globalisation has affected seed sovereignty. ACB. 2017. The Bayer-Monsanto merger: implications for South Africa’s agricultural future and its smallholder farmers [Online]. Available from: http://acbio.org.za/wp-content/uploads/2017/02/Bayer-Monsanto-report.pdf [Accessed 4th March 2017]. Altieri, M.A. 2009. Agroecology, small farms and food sovereignty. Monthly Review [Online]. Available from: http://search.proquest.com/openview/98165d33d3bec3c0f47ca6821e49eef0/1, 61(3), pp. 102–113 [Accessed 6th December 2010]. ETC (Erosion, Technology and Concentration Group). 2009. Who will feed us? Questions for the food and climate crises [Online]. Available from: http://www.etcgroup.org/sites/www.etcgroup.org/files/web_who_will_feed_us_with_notes_0.pdf [Accessed 1stFebruary 2012]. ETC (Erosion, Technology and Concentration Group). 2010. Capturing climate genes. Gene giants stockpile ‘climate-ready’ patents [Online]. Available from: http://www.etcgroup.org/content/gene-giants-stockpile-patents-“climateready”-crops-bid-become-biomassters-0 [Accessed 1st February 2012]. FAO. 2006. Food Security. FAO Policy Brief, June 2006, Issue 2. Available at http://www.fao.org/fileadmin/templates/faoitaly/documents/pdf/pdf_Food_Security_Cocept_Note.pdf. Accessed 26 Dec 2018. FAO. 2009. Proceedings of the second World Seed Conference. Responding to the challenges of a changing world: The role of new plant varieties and high quality seed in agriculture. FAO Headquarters, Rome, September 8–10 [Online]. Available from: www.fao.org/docrep/014/am490e/am490e00.pdf [Accessed 11th May 2013]. Rome: FAO. FAO. 2010. The second report on the state of the world’s plant genetic resources for food and agriculture [Online]. Available from: www.fao.org/docrep/013/i1500e/i1500e.pdf [Accessed 19th December 2015] Rome: FAO. FAO. 2014. The state of food and agriculture. Innovation in family farming [Online]. Available from: www.fao.org/publications/sofa/2014/en [Accessed 11th May 2013]. Rome: FAO. Focus on the Global South and GRAIN. 2004. Iraq’s new patent law: a declaration of war against farmers [Online]. Available from: https://www.grain.org/article/entries/150-iraq-s-new-patent-law-a-declaration-of-war-against-farmers [Accessed 31st March 2017]. Future Agricultures. 2014. Emerging seed markets: the role of Brazilian, Chinese and Indian seeds in African agriculture. Future Agricultures Policy Brief 79, October 2014 [Online]. Available from: www.future-agriculture.org. [Accessed 3rd August 2015]. Gates Foundation and AGRA. 2015. Investing in agriculture to reduce poverty and hunger [Online]. Available from: http://www.gatesfoundation.org/How-We-Work/Resources/Grantee-Profiles/Grantee-Profile-Alliance-for-a-Green-Revolution-in-Africa-AGRA [Accessed 21stOctober 2015]. Hassan, G. 2005. Biopiracy and GMOs: the fate of Iraq’s agriculture [Online]. Available from: http://www.globalresearch.ca/biopiracy-and-gmos-the-fate-of-iraq-s-agriculture/1447 [Accessed 12th March 2013]. Kloppenburg, J. 2008. Seeds, sovereignty, and the Via Campesina. Plants, Property, and the Promise of Open Source Biology [Online]. Available from: https://www.researchgate.net/publication/255583305_Seeds_Sovereignty_and_the_Via_Campesina_Plants_Property_and_the_Promise_of_Open_Source_Biology [Accessed 10th April 2017]. La Via Campesina (LVC). 1996. The right to produce and access to land [Online]. Available from: http://www.acordinternational.org/silo/files/decfoodsov1996.pdf [Accessed 22nd December 2018]. La Via Campesina (LVC). 2008. Declaration of Maputo. IN: V International Conference of LVC, October 19–22 [Online]. Available from: http://viacampesina.org/en/index.php/our-conferences-mainmenu-28/5-maputo-2008-mainmenu-68/declarations-mainmenu-70/602-open-letter-from-maputo-v-international-conference-of-la-vcampesina [Accessed 22nd June 2015]. Shiva, V. 2013. The law of the seed. [Online]. Available from: www.navdanya.org/attachments/Latest_Publications4.pdf [Accessed 2nd April 2015]. The Guardian. 2014. G8 New Alliance condemned as a new wave of colonialism in Africa. The Guardian [Online], 18th February. Available from: https://www.theguardian.com/global-development/2014/feb/18/g8-new-alliance-condemned-new-colonialism [Accessed 14/8/2014]. USAID. 2012. Ethiopia country development cooperation strategy 2011–2015: accelerating the transformation toward prosperity [Online]. Available from: https://www.usaid.gov/sites/default/files/documents/1860/Country%20Development%20Cooperation%20Strategy%20-%20Ethiopia%20March%202012.pdf. [Accessed 12th January 2014]. World Bank. 2013a. World Bank Group Agriculture Action Plan 2013–1015 [Online]. Available from: http://documents.worldbank.org/curated/en/2013/03/1749873:bank-group-agriculture-action-plan-2013-2015. [Accessed 22nd June 2015].